Ware was en fete on Bank Holiday Monday when large crowds were attracted by a programme of carnival events and sports arranged by the Ware British Legion. The weather was unsettled but apart from a few showers the rain held off and the pleasure seekers complete with mackintoshes and umbrellas were undeterred. Crowds of between three and four thousand assembled at Fanhams Road for the crowing of the Carnival Queen, and also at Allenbury’s Sports Ground for the sports and fun fair. In spite of the rain, 600 spectators turned out to watch the comic football match in the morning. It is believed that the profits will amount to over £100. Festivities started with a comic football match on the Town Ground in the morning and the game, under the direction of S Goodey, provided ample amusement for the many spectators. The costumes of the players varied from mortar boards and black gowns to policemen’s helmets and military tunics. 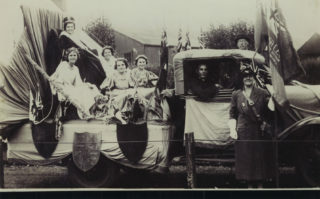 The chief event of the day, the crowning of the Carnival Queen, Miss M.E Rayment by Miss Dinah Sheridan, the film actress took place in Fanhams Road. Arriving at Fanhams in a motor car, Miss rayment took her seat on the ‘throne’ surrounded by her maids of honour, the Misses V.G Slater, Hilda Johnson, Muriel Huggins and J.Wright. After the ‘Queen’ had been crowned by Miss Sheridan, Mr F.J Weatherley, Chairman of the Ware British Legion, said they had just witnessed an interesting and historic event and ware now joined the long list of towns which boasted a ‘Queen’. He hoped this would be the first of many such events and thanked Miss Dinah Sheridan for the part she had played. Miss Sheridan thanked the crowd for the great reception they had given her. A procession of decorated cars, tableaux and people in fancy dress then paraded through the town. At Park Road there was a car rally and prizes were awarded for the smartest cars. In the afternoon, sports were held on Allenbury’s Sports Ground. For those not interested in sports there were side-shows organised by Mr and Mrs Riddle and pony rides for the children. A fun fair included spinner, hoop-la, Aladdin’s Cave, bran tub, darts, jug the ball, football, bagatelle, coconut shies etc. At the conclusion of the sports, a dog show and race was held.